Draw a Bass Clef - Let's Learn How to Say it First! In my Blog "How to Draw a Treble Clef", we looked at my Musical Pet Peeves regarding the Treble Clef. Today I would like to explore my Pet Peeves to pronounce and draw a Bass Clef! We will learn hints on how to say the word "Bass" properly and how to draw a Bass Clef properly! The Bass Clef is not pronounced like the fish (a Bass), it is pronounced like the BASE in Baseball. 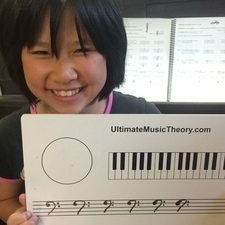 Watch this Ultimate Music Theory Lesson with Granny D - Bass Clef. To get my students to remember this, I have them stand up beside the piano, using their best "baseball stance", and "pitch" a note to the F below Middle C on the Keyboard. Then, using our Whiteboards, we practice "pitching" (writing) the note on line 4 - the F line - in the Bass Clef. Remind my students how to pronounce "Bass". Remind my students how to draw a Bass Clef when they write (and pitch) the dots of the Bass Clef properly on the Staff. How to Play "Bass Clef Baseball"
Step #1 - Draw 3 baseballs on a piece of paper and cut them out. Step #2 - Draw a baseball bat, cut it out and write "F line" on it. Step #3 - Draw a large staff on the back of your UMT Whiteboard. Step #4 - Draw the "half heart" of the Bass Clef sign (without the dots!). Hint - check your local craft store for foam - you might find pre-made baseballs and bats (or you can use foam to make your own). 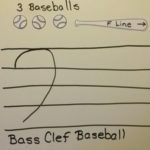 Now..."PLAY DRAW A BASS CLEF BASEBALL" (using your deepest "baseball Announcer Voice"!). Standing in their "baseball stance", ask your student to place the 3 Baseballs and the bat on the Whiteboard. Baseball #1 is pitched on line #4 at the beginning of the "half heart". Baseball #2 is pitched in space #3 after the "half heart". Baseball #3 is pitched in space #4 after the "half heart". The F Line Bat is then placed to pitch the F line (line #4). And the "crowd goes wild"! 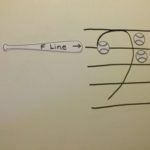 Hint - have more fun (and reinforce this concept) by having your student draw 3 more whole note "baseballs" on the F line! It is important that we teach our students that the "3 dots" (or baseballs) used to draw a Bass Clef need to be filled in (and not left open). So, while playing our "Draw a Bass Clef Baseball" will help reinforce how to say "Bass Clef" and where to pitch the 3 dots, we must also have them practice filling the dots in. Yes, another "Shelagh Pet Peeve" is seeing when students draw a Bass Clef with white circles instead of black dots. "pitched” between dot #2 in space #3 and dot #3 in space #4. When you draw a Bass Clef - remember, these dots are black dots, not circles! 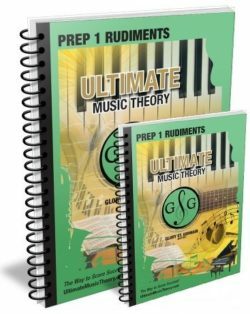 In the Ultimate Music Theory Prep 1 Rudiment Workbook on Page 13, students learn how to draw a Bass Clef in 3 easy steps. Now that your students know how to draw the Treble Clef and the Bass Clef, they can draw the Grand Staff. the Bass Clef is on the Bottom of the Grand Staff as it is in the Basement. 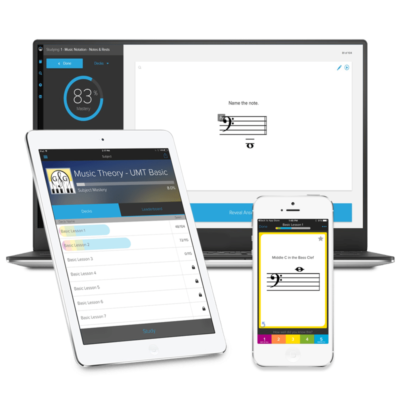 Do you have your Ultimate Music Theory Whiteboards? They are a "must have" for every studio! The Large Teacher Whiteboard comes with a large eraser, 5 different coloured dry-erase markers and a stand. This whiteboard is so light, even I can hold it with 1 hand! The Small Teacher Whiteboard is perfect for every student. It comes with a small eraser and a black dry-erase marker. It also fits perfectly in the UMT Tote Bag! By practicing how to draw a Bass Clef on their whiteboard, students will have fun while learning! Order Today! You'll love your UMT Whiteboards! And if you have any Musical Pet Peeves, please let me know about them. I am always looking for Blog Ideas! Thank you so much Jacqueline. Shelagh and I had lots of fun doing the video! Glory and Shelagh, you ladies are so clever!! !